I have compiled the BTCD GUI binary using https://github.com/laowais/bitcoindark code inside my Raspberry Pi 2, which took a long time. The compiled binary from official source which has not been tempered with, you can download below with SHA1 checksum. Download the BTCD wallet for raspi 2 in your desired folder from above. Open a terminal window and cd into the folder where you downloaded the BTCD wallet. With the above code, if you see it goes full screen or not properly viewable, close the program and run with the following command. Now the wallet should run in a proper sized window, allowing you to perform all the tasks. It will take some time to sync the blockchain, unless you have a backup copy of the database to restore block and transaction database faster along with your wallet. If you want to use your old wallet and blockchain db, close the wallet app, navigate to .BitcoinDark folder, delete everything in there and copy your old backup files in the folder and start the wallet. It may take a minute or two to start the app. Please consider donating (BTCD: RQQ5k7jnkPivmjK6TAFGhiT9rrVV7astKy) if this post helped you. Don’t forget to check my work, Explorebtcd.info – Official BitcoinDark block explorer which is serving 24/7 from an SSD VPS without failure and downtime for the past few months and BTCD Top 500 Rich List. Hey, thanks for your comment. bitcoindarkd compilation would be very easy without the GUI and QT. I followed the official QT build instructions from GitHub BTCD repository. If you don’t need GUI, just simply read the UNIX instructions from here and you can build the headless version. Took me about 12 hours to compile QT5 in my Raspberry Pi 2, because I wanted to have the GUI too. I used instructions from this page to compile QT5 in my Pi. 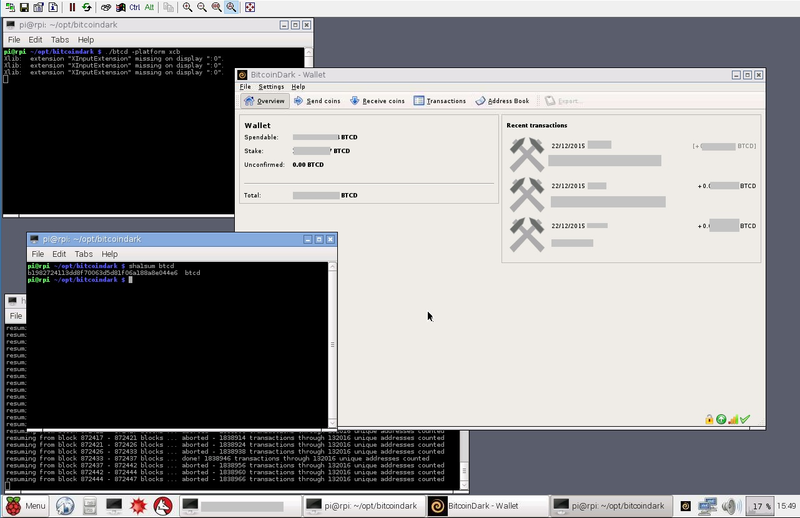 I don’t know yet how to use bitcoindarkd, but I’ve read it needs much less RAM than the QT GUI version. As I’d like to run several clients on the same raspberry, I need the “d” versions of them. I’ve already tried to build bitcoindarkd with the doc/build-unix.txt help (and I checked again this evening…), but it still tries to build the GUI version, it fails, and there’s no bitcoindarkd binary to use. Moreover, I tried your binary and it seems to work fine on rokos v3, but on my raspbian (jessie version), it doesn’t. That’s why I’d like to compile from sources. For using the bitcoindarkd version please head back to the forum or ask in the Slack channel. I did not use the command line version that much except for SuperNET testing in the beginning. Have you read and installed all the dependencies mentioned on doc/build-unix.txt? Line 67 is the section for it and the commands are there. Please try this command inside src folder make -f makefile.unix or make -f makefile.unix “USE_UPNP=-“. These are the only instructions I have followed to compile my wallet on any Linux environment and it worked perfectly for me. Yes, I’ve read and installed all the dependencies mentioned on doc/build-unix.txt, and it tries to build the QT version when I ran the 2 commands mentioned there too (qmake & make). I’ll try the 2 commands you advise me as soon as I have some time. I think the error is in the doc/build-unix.txt: it’s written to run “qmake “USE_UPNP=-” && make -j 3 -f Makefile”, but “qmake” uses the BitcoinDark-qt.pro file (or so), and then tries to compile the QT version.